We often think of movies as escapist fare, the only purpose of which is to entertain us. There are many films, however, that have not only brought social, political and environmental issues into sharper focus but have also influenced public opinion and created a call for action. 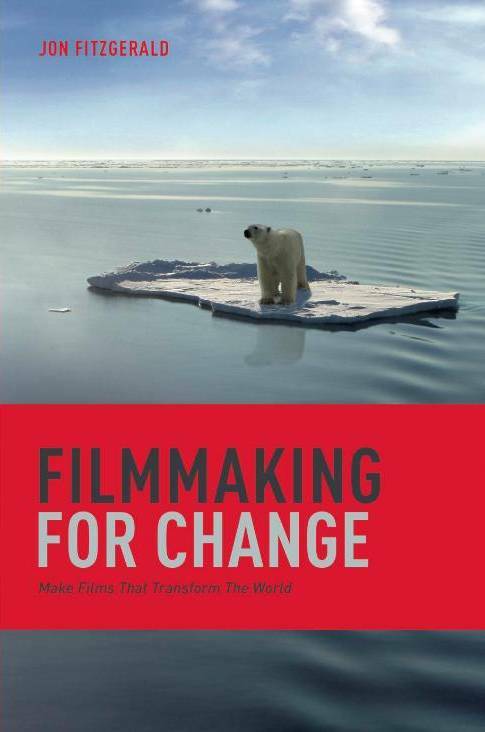 The transformative power of this visual medium and how today’s screenwriters and producers are using it to change the world is the subject of Jon Fitzgerald’s new book, Filmmaking for Change. Let’s start with some background on when, where and how it was that you first knew you wanted to be in the film business. Who were your mentors in the early years and what was some of the best advice they gave you about being a filmmaker? I had a bunch! It started with my first film professor, Janet Walker. She was very inspirational and supportive. And then there was my screenwriting professor Paul Lazarus. He really taught me how to write. Then a number of film execs on movies I worked on. And once I fell into festival directing – when my movie didn’t get into Sundance and we started Slamdance – I had the pleasure of meeting Steven Soderbergh who gave us some films, became a friend and mentor and eventually invested in my first real movie company and movie The Back Nine. They all taught me to follow my heart and my passion to try to tell stories I knew something about, rather than trying to fit a Hollywood formula. In turn, what’s the best advice that you give others who are seeking to follow a similar path? In terms of advice I give filmmakers, it would have to be to find a subject they care about and have a keen sense of understanding for that genre. You have to write what you know, or are passionate about. And in a genre you understand. Someone who wants to write a thriller should know that space. Someone who has a sense of comedy and timing is better off exploring that, rather than trying to direct a thriller because they are easier to sell. Sure, you can crossover later, but work in a genre you care about and study the history and talents in that space. Did you watch a lot of movies when you were growing up and, if so, which ones still linger as the most memorable and/or life-changing for you? As I mention in the book, The Adventures of Tom Sawyer had an impact, and then To Kill a Mockingbird. Twelve Angry Men. All as a youth. All were entertaining, yet had messages. What’s the last movie or documentary you watched that took your breath away? Probably have to list a few. The Welcome was one of most powerful films recently. A film about war veterans, that I since have screened as a CineCause Spotlight film. Truly powerful about the experience these heroes face. It has been rewarding to see the audience response. And I’ve seen The Cove a few times and a great film with similar messages called Minds in the Water and One Day on Earth, which was groundbreaking in showing footage all shot on the same day, from every country in the world. Tell us about the first film you ever directed. After working on a number of films, constantly revising the script until I was ready, I directed Self Portrait (the same script I started years ago as The Summer’s Edge). I feel like it was a decent movie but, ultimately, with very little money and a fairly conservative storyline, it was hard to stand out. Coming of Age is a tough genre, particularly when you are trying to break in. While I still believe you have to write what you know, or study a certain genre or tone that speaks to you, it’s so hard to break in as a director, I think it helps to have a visual style, or brilliant screenplay, to attract attention and get a shot at your next film. And the biggest problem with most emerging filmmakers is they think the script is ready when it usually isn’t. Get help from friends and professionals to get a great story on the page, and have a great screenplay. At what point did you decide to transition from being a filmmaker to becoming a film festival director? For me, it came by accident. When my film (and two others) didn’t get into Sundance, we started Slamdance, so I learned how to be fest director on the job. What I learned fairly quickly is that this role has a lot of similarities to a film producer. And it certainly helps to have a good understanding of film history, in terms of studying the masters. You’ve now jumped back into full-time filmmaking. What were the influences behind that decision? I knew I would eventually step back into filmmaking. When I started Right Angle Studios to consult to film fests and filmmakers, I knew I would eventually launch Right Angle Pictures. It was just a question of having the time to raise the money and find the right project, which I did with The Back Nine. I felt like this story, and its inspirational theme, would connect to people who always had a dream they never had the opportunity to chase. One of our tag lines was “It’s never too late to become what you wanted to be.” and making a film about golf – one of my greatest passions – made sense. And, of course, with over 50 million golfers in North America, I felt there was an audience! Films regarding socially relevant causes are an admirable passion of yours. How did this lead to the formation of CineCause and what, exactly, does CineCause do in terms of connecting films to topical issues? Without even knowing it, I realized that the films that spoke to me, even as a youth, were films that had something to say. And when I saw what Participant did with An Inconvenient Truth and The Cove, and how they inspired people to take action – and provided the links and background information – I knew this was the right path. I just felt there was a wider platform than simply providing “causes” for one company’s films. With my experience at iFilm, I knew there was room to be a filter, a portal, to these types of films. So CineCause was created to help audiences discover socially relevant films, and provide them with related causes so they could “act” on the inspiration provided by the films. What filmmakers do you most admire who are as passionate as you are about delivering an informative or enlightening message through the medium of entertainment? That’s a long list! A lot of filmmakers over the years have covered many genres but also created films with a greater purpose. From John Ford and How Green Was My Valley to Robert Wise and The Sound of Music, to Spielberg with Schindler’s List and Soderbergh with Erin Brockovich. In documentary, Errol Morris and The Thin Blue Line to Steve James with Hoop Dreams. These are just a few examples of master storytellers who have managed to enlighten through entertainment. Should today’s aspiring filmmakers be taught social responsibility as part of their academic curriculum? I feel like film and media is the most powerful tool to affect positive change, and film schools should share in the responsibility to embrace and support the idea of training emerging filmmakers to explore using this medium to do more than just make money. Yes, it’s a business, but why not leverage this position and put it to good use? As these examples demonstrate, you can develop entertaining, profitable movies that can help make a difference in the world. In a related vein, should filmmakers be held accountable if their productions trigger negative consequences? Yes, they have to know that they influence their viewers, for better or for worse. They have to accept this responsibility once they put on the filmmaker’s hat. It’s their choice if they want to make horror films or social issue entertainment, and each has a price and a result. So tell us how your idea for Filmmaking For Change came about and who you see as your readership for it. I felt like it was time to create a text that could support the notion of developing movies with a social purpose in mind. And most film schools have not had such a direct platform. By putting some familiar films in such a context, giving examples of history and the power of film, hopefully, this can become part of future film school programs. And, as outlined in the book with the case study for Forks Over Knives, people with a message or issue to share can procure filmmakers to help realize a vision, and bring their message to the screen. And they don’t have to be trained filmmakers to develop the concepts. Was your role as a writer harder or easier than that of being a filmmaker or film festival director? In a way, this was an exercise in sharing what I have learned. Yes, I had to do some research to support the history, but otherwise, the book is divided into basic sections of Development, Production and Distribution. Over the years, I have had the pleasure not only to develop and produce such films, but to market through festivals and provide consulting in the distribution space. How did you go about developing the exercises at the end of the chapters? I just wanted to get readers to think about the categories and put them into context, so they could really apply the basic information to actual experiences they have had, or could consider. To develop any skill, it helps to see examples, to be able to model what has worked in the past. What do you see as the takeaway value of the book? It proves that anyone with a passion for an issue can develop an idea and put together a team to bring it to the screen…and have an opportunity to affect positive change. Do you one day envision yourself using the book in a classroom? Absolutely! I have taught film classes before and whether I am the instructor, or other professors embrace this tool, I hope to be part of that movement. To learn more, readers are invited to visit www.filmmakingforchange.com. Filmmaking for Change is available on Amazon as well as at Michael Wiese Productions (www.mwp.com).